If an elegant premium design phone with innovative ways to communicate plus an integrated answering machine is what you are looking for, then the Gigaset SL785 is the best telephone for you. 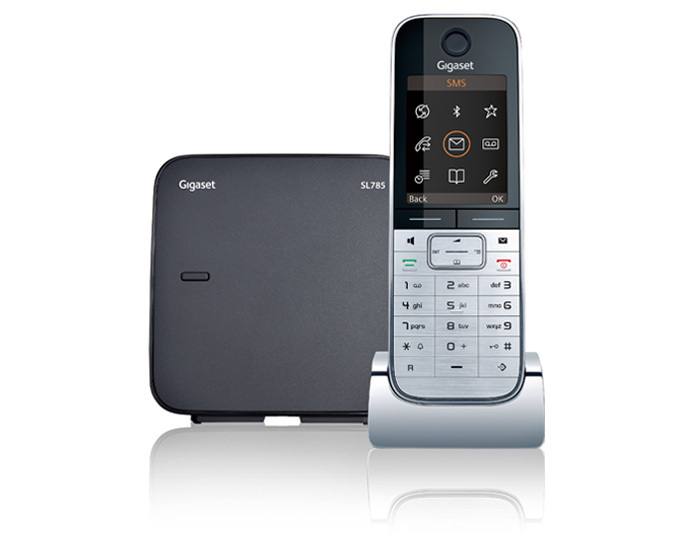 With attractive features, high-quality materials and premium design, the Siemens Gigaset SL785 lets you phone as well as enjoy the comforts of a built-in answering machine in a smart and elegant way. The handset’s genuine metal frame distinguishes the Siemens Gigaset SL785, making it truly unique and signaling the start of a new era of home phones. Choose between the Bluetooth® headset connection or full duplex hands-free feature to experience communication freedom in brilliant sound quality. Maximize the Siemens Gigaset SL785’s features by transferring data through the Bluetooth® or mini-USB connection and by filling the large 500 entry address book with the names and numbers of your numerous important contacts. Let the Siemens Gigaset SL785’s innovative user interface on the vibrant TFT color display guide you – it makes selecting features from the icon-based menu second instinct. This reliable, high-class phone with integrated answering machine is also expandable to up to 6 handsets. And with the Gigaset SL785’s ECO DECT technology you’ll always demonstrate your commitment to the environment. If an elegant premium design phone with innovative ways to communicate plus an integrated answering machine is what you are looking for, then the Siemens Gigaset SL785 is the best telephone for you. It’s a fact of life that you can’t be home every time the phone rings. Thankfully, Siemens Gigaset SL785 lets you leave the house worry-free about missing important messages. The built-in answering machine’s generous 45 minutes of recording time ensures that all callers have a chance to leave you a personal message. When you’re back at home, the phone eases listening to messages by announcing the date and time in a clear, pleasant voice. You can even listen to your messages remotely via the handset, if you’d like. And the handset even indicates whenever there is a message waiting. 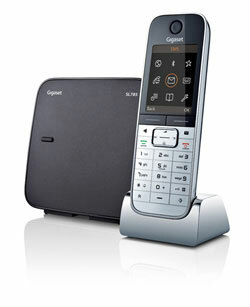 Still worried about being out when important messages come in to your Siemens Gigaset SL785? Configure your phone to notify an external number via text message every time there is new activity on your answering machine. 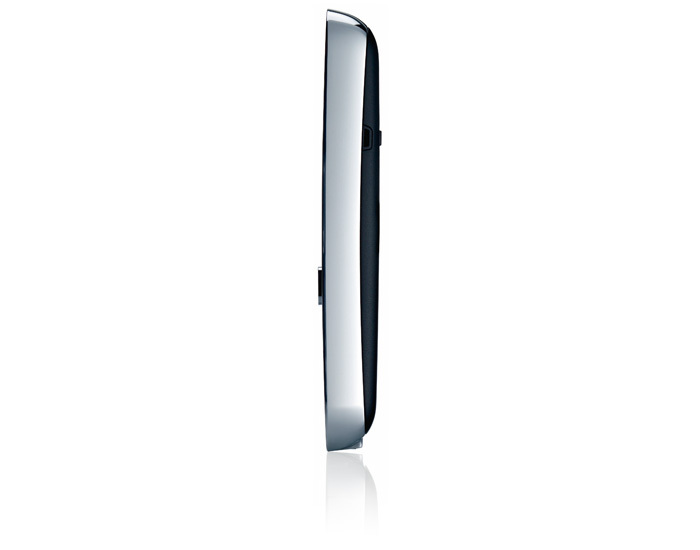 Part of what makes the Siemens Gigaset SL785 a smart premium design phone is its use of high-quality materials. The genuine metal on the handset and charger distinguishes the Siemens Gigaset SL785 from other phones, creating a high-end aesthetic that is one of a kind. What’s more, the innovative user interface opens the door to a new era of instinctive menu navigation. And the brilliant TFT color display exemplifies the Siemens Gigaset SL785’s high-class character, which sets it apart from the crowd. The Siemens Gigaset SL785 offers twofold options for hands-free talking: either via the Bluetooth® headset connection or the handset’s full duplex hands-free capabilities. Whatever you do while phoning, with the Gigaset SL785 you’ll revel in the freedom of sophisticated yet simple hands-free telephony. Equipped with high-end features like a large capacity address book, transfer of data via Bluetooth® or USB, and text messaging, contacting those closest to you has never been easier than with the Siemens Gigaset SL785. With room for 500 vCard entries you no longer have to prioritize your contacts – simply include them all. Transfer your contact data quickly and easily via Bluetooth® or the mini-USB jack and profit the most from your Siemens Gigaset SL785. Not in the mood to telephone but still want to stay in touch? Use the 640 character SMS² feature on your Siemens Gigaset SL785 handset to communicate through convenient text messaging. The energy-saving power supply of the Siemens Gigaset SL785 consumes less electricity³, so it saves you money and is better for the environment. Like all Gigaset cordless phones, it also variably reduces the transmitting power from the handset to base station depending on their distance apart. You can also reduce the transmitting power of the Gigaset SL785’s base station by 80%* simply by selecting the ECO Mode. Furthermore, radiation-free** ECO Mode Plus slashes the transmitting power by up to 100% when the handset is in standby. This way, you can enjoy a more energy-efficient way of staying connected with your family and friends. With the Siemens Gigaset SL785 you’ll profit in many ways – genuine highclass materials, elegant design and innovative features. So make this Gigaset your way to communicate and receive messages at home. The elegant phone for a new era of telephony plus an integrated answering machine. With attractive features, high-quality materials and premium design, the Gigaset SL785 lets you phone as well as enjoy the comforts of a built-in answering machine in a smart and elegant way. The handset’s genuine metal frame distinguishes the Gigaset SL785, making it truly unique and signaling the start of a new era of home phones. Choose between the Bluetooth® headset connection or full duplex hands-free feature to experience communication freedom in brilliant sound quality. Maximize the Gigaset SL785’s features by transferring data through the Bluetooth® or mini-USB connection and by filling the large 500 entry address book with the names and numbers of your numerous important contacts. Let the Gigaset SL785’s innovative user interface on the vibrant TFT color display guide you – it makes selecting features from the icon-based menu second instinct. This reliable, high-class phone with integrated answering machine is also expandable to up to 6 handsets. And with the Gigaset SL785’s ECO DECT technology you’ll always demonstrate your commitment to the environment.